Xara and MAGIX continue to release localized versions of both Xara Xtreme Pro 4 and Magix Xtreme Photo & Graphic Designer 2. This months' launches include a new French and Spanish language website for Xara - more details below. A new 'crossgrade' option is also adding new owners to the Xara community - if you have a competitor's graphics product in the cupboard and you're still considering the move to Xara, or you have friends or colleagues that need to be persuaded, you may qualify for a significant discount on Xtreme Pro 4 (in all languages), more information below. 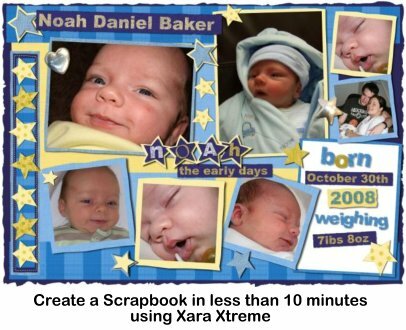 In this month's tutorial we create a custom scrapbook page in Xtreme, hopefully providing useful tips on customizing the Xtreme templates even for those of you unfamiliar with the world of scrapbooking. One final note about this month's offer: we're running a return to launch pricing on upgrades from Xara Xtreme 3.2 and Xtreme Pro 3.x, so if you haven't upgraded yet now is the moment, there's only a couple of days left! Some irresistible car images from the master of reflections and chrome, Ron Duke. This month is your last chance to enter our quarterly contest. 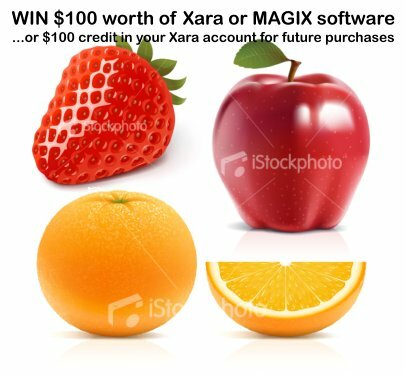 The deadline is now 14th November, the prize is $100 of Xara or Magix software of your choice or a $100 credit to your Xara account. The contest theme continues to be Food: Follow this link to a selection of great iStockphoto drawings like the ones above to inspire your foodie ideas. iStockphoto Ideas. Xara has introduced a new crossgrade option to encourage owners of other graphics software to try Xara Xtreme Pro. So if you're considering Xtreme Pro and you've got something with, for example, a Corel or Adobe label in storage, you could save $$s on the cost of a first time purchase of Xtreme Pro! Released this month, French and Spanish versions of Xara Xtreme Pro 4, along with complete French and Spanish language versions of the Xara site. New in October, MAGIX has launched more localized versions of MAGIX Xtreme Photo & Graphic Designer v2. This is equivalent to Xara Xtreme v4 and is sold both online and in retail stores throughout France, Spain and Holland. 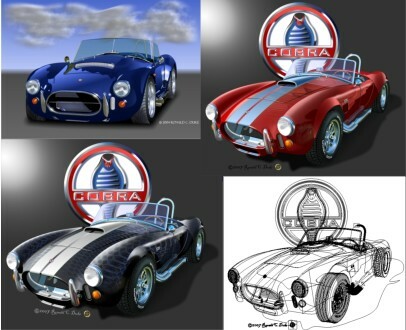 "A great graphics creation package for all levels of user ability." To copy the attributes (color, line thickness, fill) from one object to another, copy the source object (Ctrl + C), select the destination object and then Paste Attributes (Ctrl + Shift + A). You can determine whether Xtreme gives new objects that you create the last attributes (colors, fills etc) you applied. See the 'Give new objects most recent attributes' option in Utilities > Options > General. What sort of website do you have? Check out this movie posted by 'GlumShadow' on YouTube - 5 minutes later you'll know exactly how he created this excellent pencil & sharpener icon.